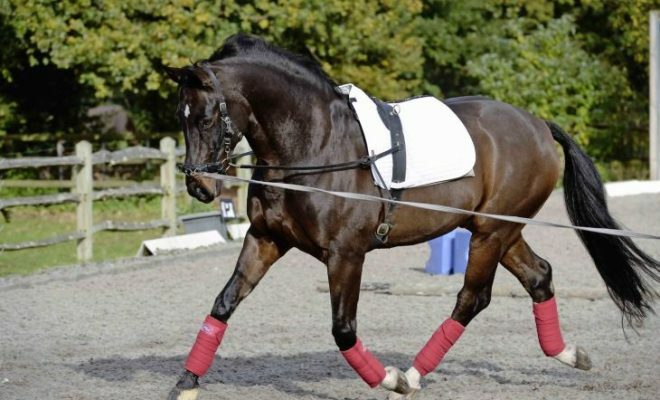 Although turn-out is not marked as part of your dressage test, smart presentation goes a long way to creating a professional impression for the judge as you ride down the centre line. 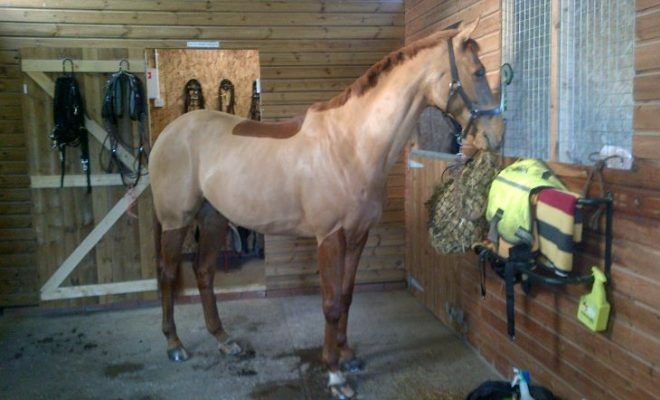 You could choose to plait your horse’s mane and tail, but it’s just as acceptable to pull them neatly. In fact, a well-pulled tail can help to improve your horse’s overall appearance and can really flatter your horse’s hindquarters. A pulled tail should look symmetrical and be pulled far enough down the dock to allow the shape to fan out naturally into the length of the tail. You can pull a tail by hand, or with scissors, clippers or a thinning/pulling comb. Before you set to work, look at the shape of your horse’s quarters, and watch how he carries his tail. This will enable you to judge correctly how far down the dock you are going to need to pull, in order to achieve the desired effect. Pulling a horse’s tail after exercise will make it easier for you and more comfortable for him. 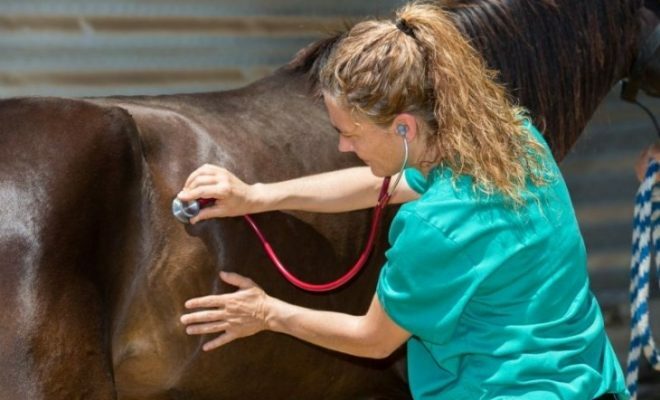 After exercise, your horse will be warm, and his pores will be open, allowing the hair to fall out more easily and less painfully. 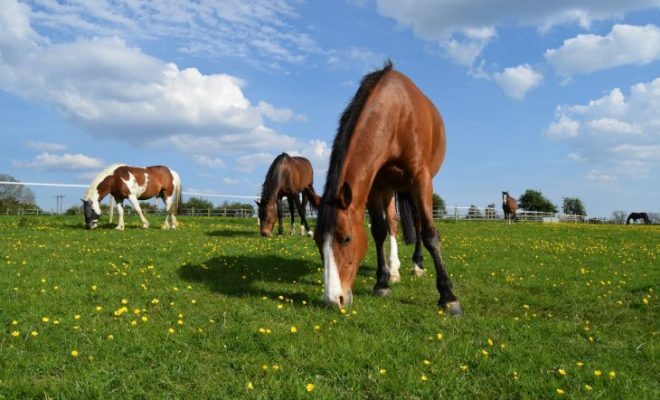 Some horses actually enjoy the experience of tail pulling, but if yours is a fidget, a haynet will help to distract him and keep him busy as you work. 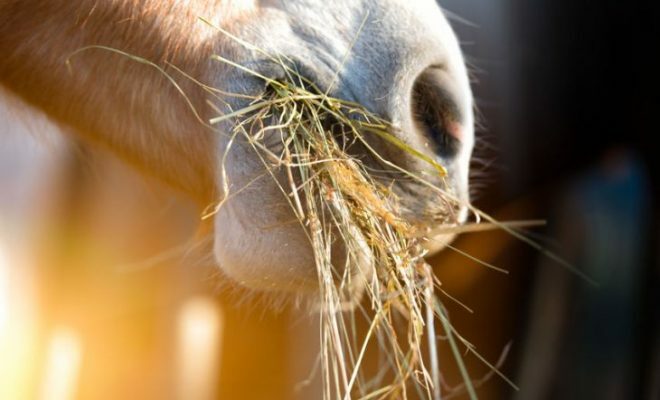 Before pulling, make sure you have combed through the tail so that there are no knots which would make it painful for the horse. Wear a lightweight pair of rubber gloves when tail pulling to help you get a better grip on the hair, as well as giving you some protection against blisters. Surgical gloves are ideal for this. 1. Starting at the top of the dock, comb a section of the hair out from the edge. Pull out the long hairs sharply and quickly, and repeat to about half-way down the dock. 2. To achieve the best result, pull more hairs from the edge than from the centre. The dock should appear to be evenly covered with hair. 4. When you’ve finished pulling the tail, always brush the top of it with a water brush and bandage it. This will encourage the tail to lie flat and look smart; not like a toilet brush! If you are pulling the tail for the first time, or you are re-pulling a tail that has been left to grow particularly thick, it may take a few sessions before you achieve the shape you want. Remember that as far as the horse is concerned, having his tail pulled is rather like you plucking your eyebrows; the process can be uncomfortable, so little and often is the best approach. The tail must also be trimmed to the correct length at the bottom in order to achieve a balanced picture. The theory is to cut the bottom of the tail straight across so that it hangs evenly and crisply. Start with a clean, dry, and combed out tail. You want to cut the tail according to how your horse carries it when he works. 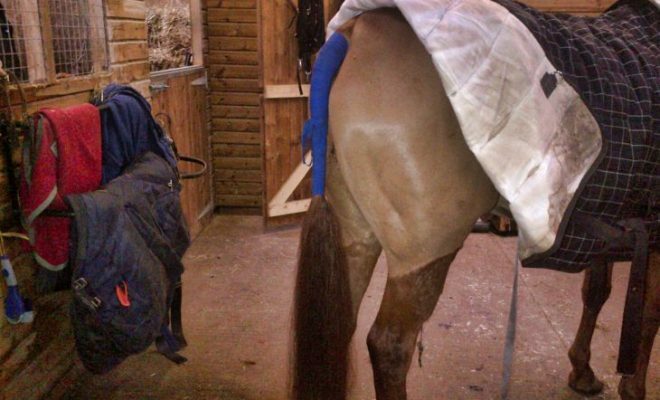 Use a whip or polo wrap wedged under the tail bone so that it pokes out just a bit, or a lot, depending on your horse. Grab the tail in your fist and gently slide down towards the ground, until you are at the desired length, then use super-sharp scissors to cut straight across. If you don’t want to pull the tail by hand, using scissors, clippers or a thinning/pulling comb are alternative ways of doing it. Whatever method you choose, you will be removing the same hairs on either side of the dock. Simply trim the wild hairs by holding the scissors vertically alongside the dock to tidy up the tail. If you use clippers, have a really good idea how and where you want them to go. A good suggestion is to start on the very underside of the tail, and not too far down. If you need to clip more, you can. 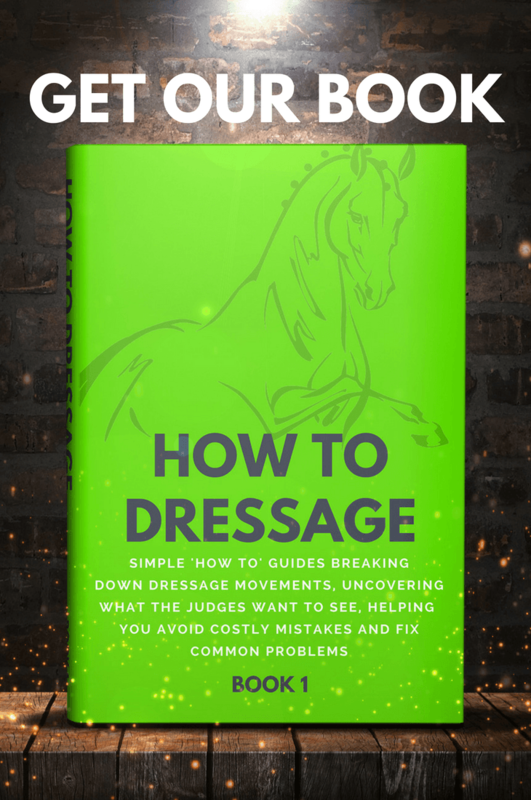 Neat and tidy presentation of your horse can go a long way to creating a good first impression for the dressage judge. Enhance your horse’s turn-out with a well-pulled tail for a really professional finishing touch. 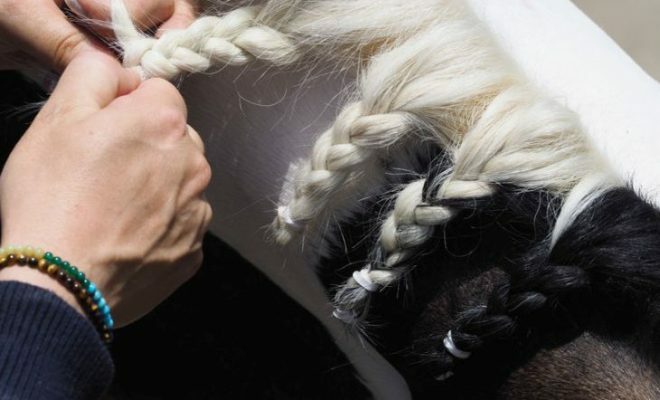 If you prefer to let your horse’s tail grow naturally without trimming it, then we recommend that you plait the tail at the dock when competing.